FILE - Smoke bellows after a suicide car bomb blast attacked a military convoy in Lashkar Gah, Helmand province, Afghanistan, Nov. 15, 2015. The Taliban has denounced NATO’s decision to extend its mission in Afghanistan by keeping 12,000 troops through 2016 and continuing military financial assistance to the Kabul government through 2020. In a statement issued Wednesday, the Islamist insurgency reiterated its resolve to continue the Taliban-led “jihad” against what it calls the country’s “occupation” until the last foreign soldier leaves Afghanistan. “The Islamic Emirate (the Taliban) strongly condemns the NATO decision to continue the war in Afghanistan. It will add to problems facing Afghans and further destabilize the region, waste opportunities and discredit the NATO itself,” said Taliban spokesman Zabihullah Mujahid. NATO Secretary-General Jens Stoltenberg said Tuesday the alliance will pledge approximately 12,000 troops as part of its Afghan Resolute Support mission. He made the announcement in Brussels after NATO foreign ministers endorsed the decision. Afghan Foreign Minister Salahuddin Rabbani welcomed the extension, saying it will help Afghanistan grow as a stable, prosperous and democratic country. “In spite of many challenges we face, Afghanistan has done much better than expected. As we reach the end of this decisive year we can say with great confidence that our common enemy has been psychologically defeated,” said Rabbani. Other than the brief fall of the northern city of Kunduz to the Taliban in September, Rabbani said Afghan national security forces have successfully defended the rest of the country without any direct international support during this fighting season. 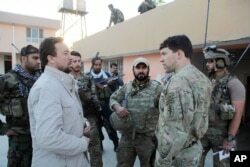 FILE - Kunduz chief of police, Mohammad Qasim Jangalbagh, left, talks to U.S. and Afghan special forces in Kunduz city, north of Kabul, Afghanistan, Oct. 1, 2015. The United States and its allies invaded Afghanistan in 2001 after the September 11 al-Qaida-plotted terrorist attacks to punish the Taliban for sheltering the terrorist network on its soil. NATO took over command of the counter-terrorism operation in 2003 but ended the combat mission last year, leaving around 13,000 troops in Afghanistan to train and advise local security forces. But the drawdown of foreign forces has emboldened the resurgent Taliban, which have inflicted heavy casualties on Afghan forces and have made territorial gains in remote areas. The insurgent advances prompted the United States in mid-October to slow down its own military withdrawal. Foreign Minister Rabbani said that Kabul is open to peace and reconciliation talks with Taliban members who are willing to negotiate, recognize the Afghan constitution and renounce ties with terrorist groups. He particularly underscored the need for “sincere” commitment and support from neighboring Pakistan for the peace process to succeed. “The recent meeting that took place in Paris between the leaders of the two countries, we hope that as a result of this, and the upcoming conference, the Heart of Asia on December 9 will be an opportunity to discuss that…Without the support of Pakistan it would be difficult that we would make any progress in the peace and reconciliation process,” he said. Afghan President Ashraf Ghani held talks with Pakistani Prime Minister Nawaz Sharif earlier this week on the sidelines of the U.N. climate change conference in Paris, breaking months of deadlock in bilateral ties. The two leaders agreed to renew efforts to seek a negotiated settlement to the Afghan war. Leaders in Afghanistan allege that the Taliban insurgency is directed, equipped and trained in Pakistan, charges Islamabad rejects. Speaking on French television after talks with Sharif, the Afghan president said he was considering an invitation to attend next week’s Heart of Asia conference in Pakistan where regional countries discuss efforts to promote political and economic stability in Afghanistan. It is not known whether Ghani formally asked Sharif to facilitate talks with the Taliban. When asked whether he will trust another Islamabad-mediated peace process, the Afghan president said: "Pakistan can be a broker. The trust needs to be earned."